I sent the following out today. If you know someone in one of these ten businesses, urge them to take up the challenge. Or if you know other businesses, foundations or non-profits who would like to get involved, have them contact me. I am contacting you because you represent one of Richmond’s ten largest private sector employers (see below). If you work for one of these ten and are not part of the management team, please make sure this email reaches the right people. I am asking each of you to donate at least $154,000 to establish and operate a managed and supported homeless camp for one year that will serve a minimum of 100 homeless people with shelter and critical support services that could change or save their lives. Or alternatively, partner with a foundation or non-profit organization or offer in-kind services. According to the 2018 Point in Time count (see summary at the end of this email), there are at least 270 unsheltered homeless people in Richmond. Unlike Oakland, Berkley and San Francisco, they are not concentrated in large visible camps in urban areas. In Richmond, they tend to be more scattered – hidden along I-80 and I-580, along the BNSF and SP tracks, along Wildcat and San Pablo creeks, and even downtown near the GRIP facility (see typical locations below). No city has really solved the homeless problem. It remains intractable. But we have to do something. Some of the businesses to whom this is addressed are already spending huge amounts. BNSF alone spent some $800,000 this year abating homeless camps on railroad rights-of-ways in Richmond. 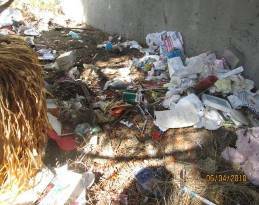 What happens when a “pop up” homeless encampment is abated by a public agency? Maybe 20 to 25 percent of the campers who are offered access to a shelter or other program that can take them off the streets accept. For these reasons and more, most homeless people do not want to go to a shelter that restricts their lifestyle. On Monday, June 25, 2018, the City of Richmond, assisted by Contra Costa CORE (The Coordinated Outreach Referral, Engagement) Team, abated an encampment with about 25 people located adjacent to the 22nd Street grade separation. About three people accepted an offer to move to a County shelter. The remainder dispersed, and the site was cleaned up. The next day, June 26, the encampment was reestablished. Whatever money the City of Richmond spent was totally wasted. While permanent housing, successful mental health and drug abuse treatment and even jobs remain long term goals, they are expensive and take time, at best. At worst, they are simply not going to happen. Encampments come with significant problems for the surrounding community, including health, blight, crime, drug abuse and fear. They also foster an image that the neighborhood is declining with an effect on property values. Encampments are political flashpoints with no solution. Neighbors and other community members want them to go away. Others argue that compassion should prevail, and the City should support and nurture the camps. You can’t really argue that either position is wrong. We have to find a solution. Currently, there is little funding to move homeless persons into housing, assuming housing is even available due to a low vacancy rate. The average rent for a studio apartment in Richmond is $1,400, or $16,800 per year, and there are not enough vacant units to house Richmond’s 270 (2018 PIT – Point In Time) homeless persons. It would cost $4.5 million per year just to house Richmond’s 270 homeless persons (not including supportive services) in studio apartments if enough units were even available. Until funding becomes available for permanent and long-term solutions, providing managed homeless camps in carefully selected locations may be the only solution. A number of cities have gone down this road, and success has been mixed. All have been expensive and complicated. Some have failed and eventually been removed. Alternatives for shelter typically include “tiny homes,” “tuff sheds” and recreational vehicles. It costs a minimum of about $1 million a year, or more, to outfit and operate a managed encampment. Oakland has two “tuff shed” camps, each with 20 sheds that accommodate two persons, for a total of 40 persons per site. 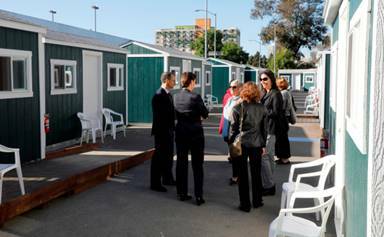 The City rents the site, provides portapotties and contracts for a mobile shower paid for by Kaiser to visit the site. According to City sources, the cost to the City is about $600,000 a year. The rest of the costs and services, which brings the total to well over $1 million, are donated with the mayor as the main fundraiser. That’s at least $25,000 per person per year, probably closer to $37,500, more than twice the cost of renting a studio apartment in Richmond. 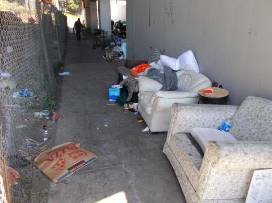 Realistically, the only way for Richmond to move away from the pattern of scattered homeless encampments is to provide one or more managed encampments that provide the same level of freedom as unmanaged encampments. Find a site that is visually isolated from main streets but is reasonably near transportation and other services such as a grocery store. A two-acre site could handle at least 100 people. Provide the basic infrastructure such as water, toilets, handwashing and trash disposal. Provide a “day-room” for eating and service providers. Provide one or more cargo containers for secure storage of large possessions. Provide tents and a layout that at least looks organized. Maybe footlockers for secure storage of small possessions, camp beds, table and chair. Tents are cheap. Despite any intent to designate “tuff sheds” or other structures as temporary, they will become permanent. 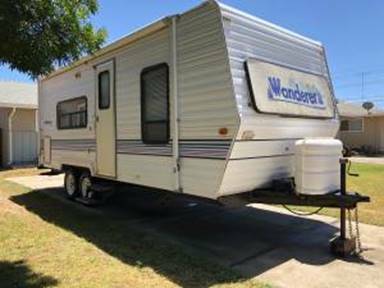 Provide parking spaces for recreational vehicles, including travel trailers. 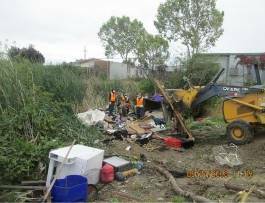 Mental health, physical health, substance abuse, job search and permanent housing search would be handled by Contra Costa CORE Team or contracted to a non-profit..
Operation of the camp would be contracted to a non-profit that may employ some campers to assist in cleanup and other operational tasks. Why tents or recreational vehicles? Any other structure is subject to regulation by the California Building Code and the State Housing Law and found in Division 13, Part 1.5 of the California Health and Safety Code (HSC), Sections 17910 to 17998.3. A legal residential structure can be very expensive, running from tens of thousands of dollars for a tiny home or dormitory to hundreds of thousands of dollars for an affordable housing unit. Any camp for homeless should be seen as only temporary, with the ultimate goal to provide permanent housing for everyone, but the reality is that a five-year plan for a camp may be required. Even a “tuff shed” village is a violation of state law governing occupied structures. There are much fewer regulations for camping. RV parks and campgrounds are under the authority of the California Department of Housing and Community Development (HCD). Campground regulations are pretty basic, focusing on safety and sanitation. California law governing mobile home parks is entitled the "Mobilehome Parks Act" and may be found in Division 13, Part 2.1 of the California Health and Safety Code, commencing with Section 18200 . California law governing Special Occupancy parks is entitled the "Special Occupancy Parks Act" and may be found in Division 13, Part 2.3 of the California Health and Safety Code, commencing with Section 18860 . Local jurisdictions may apply to HCD to assume authority and manage Special Occupancy (RV) Parks Act or SOPA within their boundaries. According to Lavonna Martin, MPH, MPA, Director - Health, Housing and Homeless Services, Contra Costa Health Services, delivery of services to a large encampment requires a minimum of 3-4 case managers, 40/hours per week (each with a caseload of 25–33 persons) to connect people to the behavioral health care and long-term housing solutions they need. Deploying the CORE teams to provide the case management would remove the outreach service from the City in its original intended capacity and would require two teams to handle this level of case management and care coordination required. This is separate from the required base staffing that is required for general milieu management of the encampment. Having a non-profit manage operations 24 hours/day, 7days/week would require as much as $600,000. For the Brookside shelter operated by Contra Costa County, (which is comparable to the size the proposed project), it costs $600,000/year for just food and basic staffing (this doesn’t include blankets/linens required, utilities, case managers, etc.). That comes to $15,400 per person for a 100-bed managed homeless tent camp with extensive supportive services..
Where would the money come from? The City of Richmond cannot afford this without significantly reducing City services that serve everyone, such as parks and street maintenance, libraries, recreation or even public safety. I suggest we look for help private sector partners and foundations. 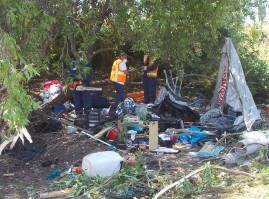 BNSF (the Railroad) just spent nearly $800,000 removing a homeless camp along its right-of-way in Richmond. Despite the huge sum, the campers just relocated. In time, they will probably be back to BNSF right-of-way. This money could have been spent to fund a managed camp instead of a wasted abatement action. Can we count on you? If you want to be a partner, contact me. Messages that in some substantive way relate to the conduct of the public’s business may be subject to disclosure under the California Public Records Act. C.O.R.E. Homeless Outreach. The Coordinated Outreach Referral, Engagement (C.O.R.E.) program works to engage and stabilize homeless individuals living outside through consistent outreach to facilitate and/or deliver health and basic need services and secure permanent housing. C.O.R.E. teams serve as an entry point into Contra Costa’s coordinated entry system for unsheltered persons and work to locate, engage, stabilize and house chronically homeless individuals and families. The outreach teams identify individuals living on the streets, assess their housing and service needs, and facilitate connection to shelter and services. To notify a C.O.R.E. team about an unsheltered homeless individual or family, please call 211. Please note that C.O.R.E. teams are not designed for crisis response. For medical or other emergencies involving homeless individuals, please call 911. Lavonna Martin advises to consider cots to cut down on possible bed bug infestation instead of beds.